Students approach the element by either climbing a knotted rope or ascending a rope ladder. The beam is free swinging and walking it is quite a challenge. It can be used in series with the high ladder. 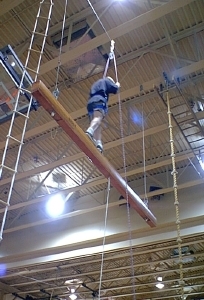 After x-ing the beam the student climbs a rope up to the ladder. Several variations are possible. The most exciting is to perform the series blindfolded.